Important new book by Roger Scruton. The environment has long been the undisputed territory of the political Left, which casts international capitalism, consumerism, and the over-exploitation of natural resources as the principle threats to the planet, and sees top-down interventions as the most effective solution. In How to Think Seriously About the Planet, Roger Scruton rejects this view and offers a fresh approach to tackling the most important political problem of our time. 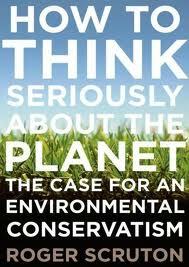 The environmental movement, he contends, is philosophically confused and has unrealistic agendas. Its sights are directed at the largescale events and the confrontation between international politics and multinational business. But Scruton argues that no large-scale environmental project, however well-intentioned, will succeed if it is not rooted in small-scale practical reasoning. Seeing things on a large scale promotes top-down solutions, managed by unaccountable bureaucracies that fail to assess local conditions and are rife with unintended consequences. Scruton argues for the greater efficacy of local initiatives over global schemes, civil association over political activism, and small-scale institutions of friendship over regulatory hyper-vigilance. And he suggests that conservatism is far better suited to solving environmental problems than either liberalism or socialism. Rather than entrusting the environment to unwieldy NGOs and international committees, we must assume personal responsibility and foster local control. People must be empowered to take charge of their environment, to care for it as they would a home, and to involve themselves through the kind of local associations that have been the traditional goal of conservative politics. Our common future is by no means assured, but as Roger Scruton clearly demonstrates in this important book, there is a path that can ensure the future safety of our planet and our species.